Life is not like a box of chocolates. When I’m left alone with a box of chocolates I puncture a few with my thumb to see if they have anything inside them that would make me gag, such as coconut or the lurid red guts of sugar-lacquered fruit. You can’t really do this with life. You’ve pretty much got to taste everything that comes your way and then either swallow it down past the rising bile or go hungry. But maybe life is like a pack of baseball cards, specifically a pack of baseball cards purchased with September looming, the sweet myth that summer will last forever disintegrating. You have been buying cards for months already, the thrill of seeing the year’s new card style long gone. You’re sure to get mostly doubles in the pack, guys you’ve already picked up in previous packs, one monotonously recognizable personage after another posing like zombies in infielder crouches or with bats outstretched. Disappointment, monotony, the taste in your mouth a quick burst of sugary gum then back to what it was before you opened the pack, the gum already a hard rubber pebble. Ah, life: Each new day a low-quality xerox of its predecessor. But if I had one message to impart in all these many cardboard prayers it would be that there’s always the chance in the late-summer baseball card pack called life that you might find a card like the one pictured here mixed in with all the doubles. I was 12 when I found this electrifying 1980 card among all the repeating Thad Bosleys and Steve Muras. At that time there was no bigger star in baseball than Nolan Ryan. He had already begun rewriting the record books, but more than that he seemed to have superpowers. Other pitchers such as Jim Palmer and Tom Seaver seemed to have more success winning ballgames and Cy Young awards, but only Nolan Ryan had the power to crack open the hard lid of the late summer sky and let a little of the dreamworld come leaking in. He threw the ball fast, faster than anyone ever had, faster than anyone ever would. A 12-year-old kid who had played his final year of little league and gone through his first demoralizing year of junior high could walk home from the store where he bought this card and hold this card and feel like he was holding a little piece of lightning from another world. 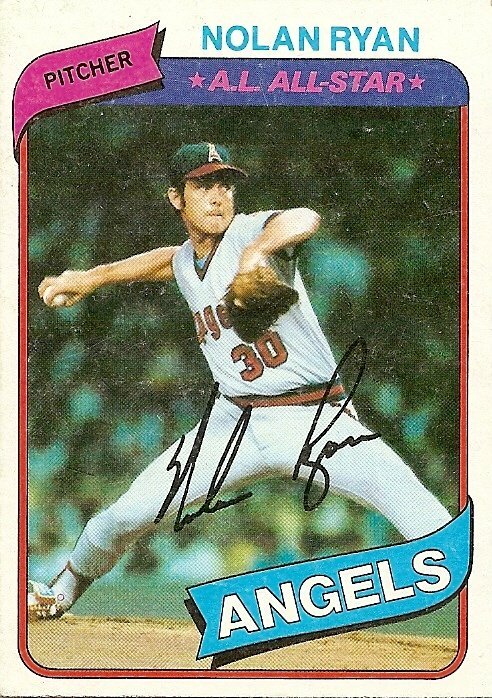 You are currently browsing the archives for the Nolan Ryan category.